Centers for Independent Living (CIL's) are grass roots organizations and have four core services that they are required to provide: systems and individual advocacy, peer support, independent living skills, training and information referral. There are over 600 Centers throughout the nation, offering unique programs and services to meet their own community needs to the best of their ability as funding allows. Active Re-Entry serves the seven counties of Eastern Utah - from the Wyoming to the Arizona border - just over 27,000 square miles. The seven counties within the service district include -- Dagget, Duchesne, Uintah, Carbon, Emery, Grand and San Juan. 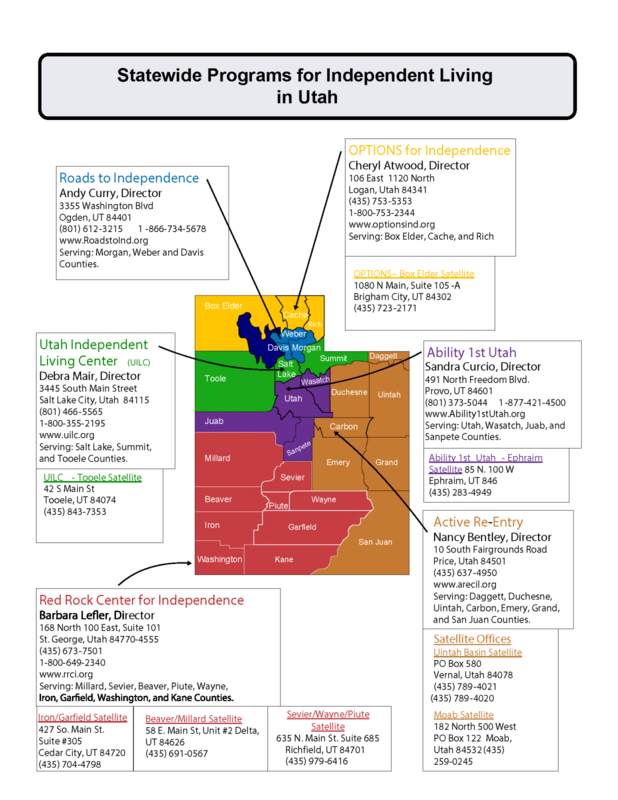 There are five other CIL's in Utah. See map below.